Boulevard Shopping Mall Kuching is proud to present you the Scarlet Charm – The Golden Monkey Triumph to welcome the Year of Monkey in the Lunar Calendar. 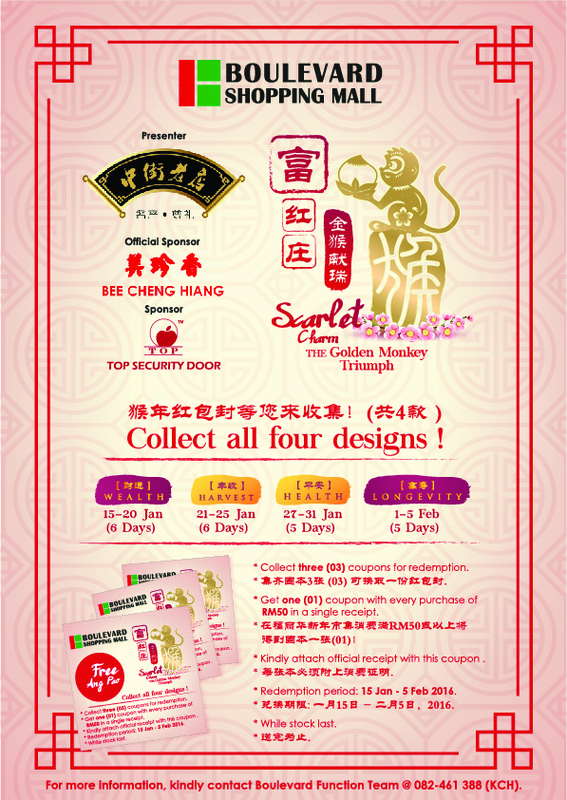 “Scarlet Charm – The Golden Monkey Triumph” will begin on the 14th of January 2016 to 5th of February 2016 consist of 23 days located at phase 2, New wing of the mall with various programs and activities. The Chinese New Year Bazaar consist more than 25 booths selling Chinese New Year’s related products such as sausages, household products, pastry cake and cookies, popcorns, hampers, rice crackers and etc. Shoppers who spend more than RM150.00 at the Chinese New Year Bazaar are entitled to collect free limited red “Angpao” packet. This year, Boulevard Shopping Mall is giving out 4 different “AngPao” designs which are wealth, health, harvest and prosperity. Redemption period started from 15th of January 2016 to 5th of February 2016 at Information Counter, ground floor, old wing. Other than Chinese New Year Bazaar, Boulevard Shopping Mall Kuching also presents many more programs and activities during this period to boost the atmosphere before Chinese New Year begin. Other “Scarlet Charm – The Golden Monkey Triumph” programs and activities are listed on the right. The business hour will be extended until 11:00pm from 30th January 2016 to 5th February 2016. 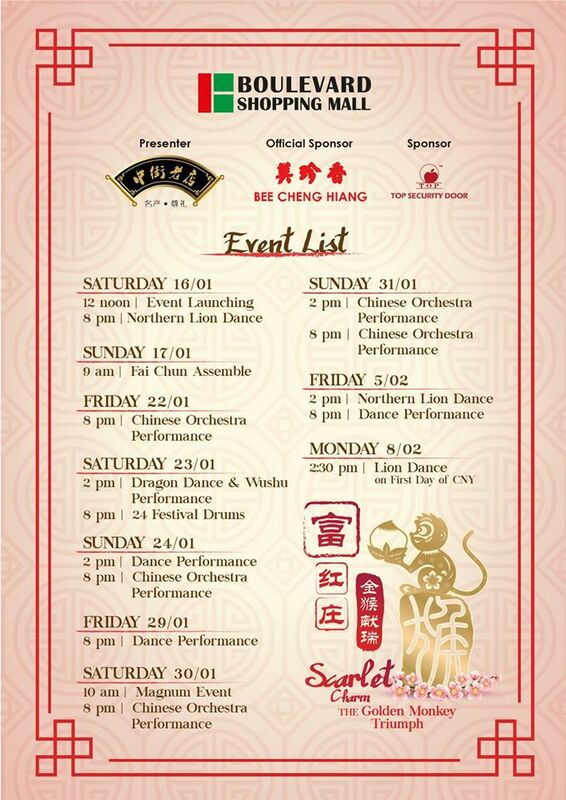 Do not hesitate to share information of “Scarlet Charm – The Golden Monkey Triumph” among your friends and family members and spend your time here to choose everything you need for Chinese New Year and witness all the exciting activities and performances! Lastly, the staffs and management of Boulevard Shopping Mall Kuching would like to wish everyone a very prosperous Chinese New Year 2016! For more information and latest updates, please log on to Boulevard Shopping Mall Kuching Facebook Page or call Function & Marketing Team at 082-461388.